Vintage Strings MkIII, Virtual subtractive synth from Musicrow. 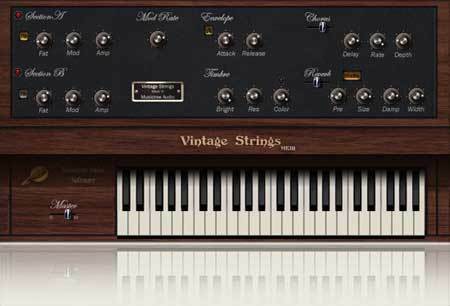 Musicrow has announce the release of Vintage Strings MkIII, a virtual string machine designed to replicate the sound of analog string ensemble keyboards from the 70’s, like the arp solina and the crumar multiman. Vintage Strings MkIII makes no use samples, so its presets can be tweaked, and new ones can be created. According to Musicrow, "The color control in the timbre section enables the creation of new beautiful choirs and pad sounds. In the envelope section you can now choose the analog envelope mode, for an emulation of vintage string machines envelopes. The reverb section was revamped and now enables you to select between a studio reverb and a spring reverb. The new 7th buttons enables each string section to play seven notes above the original pitch, for thicker string sounds. The old user interface was replaced with a new one." Emulation of vintage string machines. Two separate string sections with string sound. Chorus section that emulates the chorus effect on vintage string machines. Advanced reverb section with a studio reverb and spring reverb. Analog and regular envelope modes. 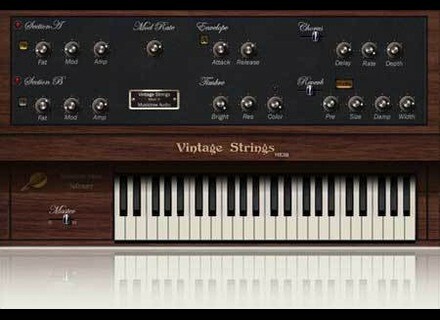 Vintage Strings MkIII is now available as a VST instrument for Windows and costs €59. Existing users of Vintage Strings MkII can upgrade to the new MkIII version for €19. A trial version and demo sounds are available onthe Musicrow site. Equinox Sounds [Smash Up The Studio] RnB Vibes: Piano Equinox Sounds has released RnB Vibes: Piano, a downloadable collection from it's content partner, Smash Up The Studio. New Atlantis Audio Polar Elements Reason ReFill Polar Elements for Propellerhead Reason 4 features a set of playable Combinator instruments for your Reason rack.